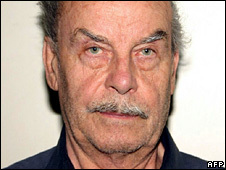 Police in Austria say Josef Fritzl may have planned the dungeon in which he incarcerated his daughter Elisabeth as early as 1978 - when she was 12. They also detailed the elaborate lengths he took to create the dungeon, which has eight separate doors. The family rescued from the house are getting to know each other again in their hospital quarters, police said. Elisabeth was incarcerated at 18 for 24 years. She bore Mr Fritzl, 73, seven children, one of whom died as a baby. The head of the jail where Mr Fritzl is being kept said he had been no problem, lived with one cell mate but was refusing to take exercise. The head of the Lower Austria criminal investigation department, Franz Polzer, said Mr Fritzl had lodged a planning request in 1978 for an extension that became the centre of the secret dungeon. 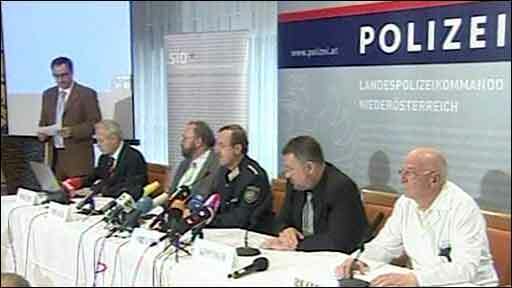 At a news conference in Amstetten, west of Vienna, police said the planning application showed Mr Fritzl may have had an "obsession" before 1984 to carry out the imprisonment and was able to deceive the family and others around him. There was a section of the extension which served as the dungeon that was not known to the planning authorities. The dungeon had at least two access points but even someone with keys would need to open eight doors with electronic locking devices for the last three. The main door weighed half a tonne. The police said they believed Mr Fritzl had acted alone and were investigating claims from people who had come forward to say they had been raped by Mr Fritzl 30 to 40 years ago. Mr Polzer said: "If we look at the factual evidence, Mr Fritzl appears to have done this all by himself. Anything else is speculation. We can only say that what this man did is beyond comprehension." Elisabeth and the freed children are being treated together in a hospital clinic. Berthold Kepplinger, the director of the clinic, said the family members had been brought things they were used to, such as an aquarium and toys for the children. "The family is finding each other again and those who did not know each other are getting to know each other," he said. "The children make their own beds and the family have lively conversations." Dr Kepplinger said those who were kept in the cellar had become more accustomed to light but Elisabeth and one child were wearing sunglasses. Elisabeth lived with her first three children in the cellar. Mr Fritzl took the other three to live upstairs with his wife, who says she knew nothing of the dungeon. Dr Kepplinger said: "Time must have passed very slowly in the dungeon. This slow-moving time is something we want to maintain in the clinic. "The children who lived upstairs are used to a different speed of life and we have offered them more to do. "The mother needs to have rest every now and then - she has a nap in the afternoon to recover from activities." The condition of the eldest child, Kerstin, 19, whose admission to hospital with a serious illness brought the alleged crimes to light, was said to have improved and stabilised. However, she is still in an induced coma and will remain so for an unspecified time. Had she not been taken to hospital, she would have died, doctors said. Prosecutors will have their first meeting with Mr Fritzl this Wednesday or Thursday. They said Mr Fritzl had been examined by a doctor and had been checked for illnesses - both physical and mental. Mr Fritzl's lawyer, Rudolf Mayer, said on Sunday his client should not go to jail as he was mentally ill. The director of the prison holding Mr Fritzl, Guenther Moerwald, told the Austrian news agency APA he was an "unproblematic inmate... calm, collected and alert". Mr Fritzl was refusing daily exercise. "He doesn't want to go out," Mr Moerwald said. Mr Fritzl shared a cell with one other inmate and "it's working very well", Mr Moerwald added.